This is 6 mm (1/4") twisted 100% hemp rope. 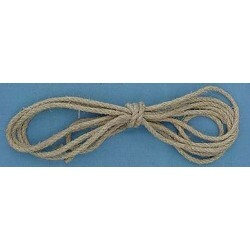 Hemp rope has many uses from tying up box's to ship rigging. This hemp rope is all natural and is close to what was used during colonial times. This is 6 mm (1/4") twisted 100% hemp rope. Hemp rope has many uses from tying up box's to ship rigging. This hemp rope is all natural and is close to what was used during colonial times. The rope has a rustic look and is ideal to use in the outdoors, it is naturally resistant to salt air and ultra violet rays.A few other uses for the rope is for historical ships, historical reenactments,hunting,gardens, carrying, lashing things together, sails rigging, anchor cord and tent ropes. Hemp rope is a strong natural rope. Just let us know how much you need. This rope can be washed and dyed.